You may open MadeToCompare via „Plug-ins; MadeToCompare“. In the dialog box, the user can select which “Range” they want to display during the comparison (full text, paragraph or single sentence) and they have the option to implement settings so that the comparison ignores different breaks, blank spaces and separators. The “Text Export” can be in the formats TXT and RFT and you can choose the storage location. When you choose “View”, the system provides several display modes, which are optimized to display the data on the monitor or in the printout. The system then displays the view as “Native” or in the “Browser”. If you choose “Native”, the comparison result opens in an InCopy window (HTML); if you choose “Browser”, the system displays the comparison result in the default browser on the computer. This contains information such as the file name, author, version, most recent changes, the number of characters and status. Please note: some of this information is only available when MadeToCompare is integrated into an editorial system. … displays additionally file information overview and changes overview in a compact style. 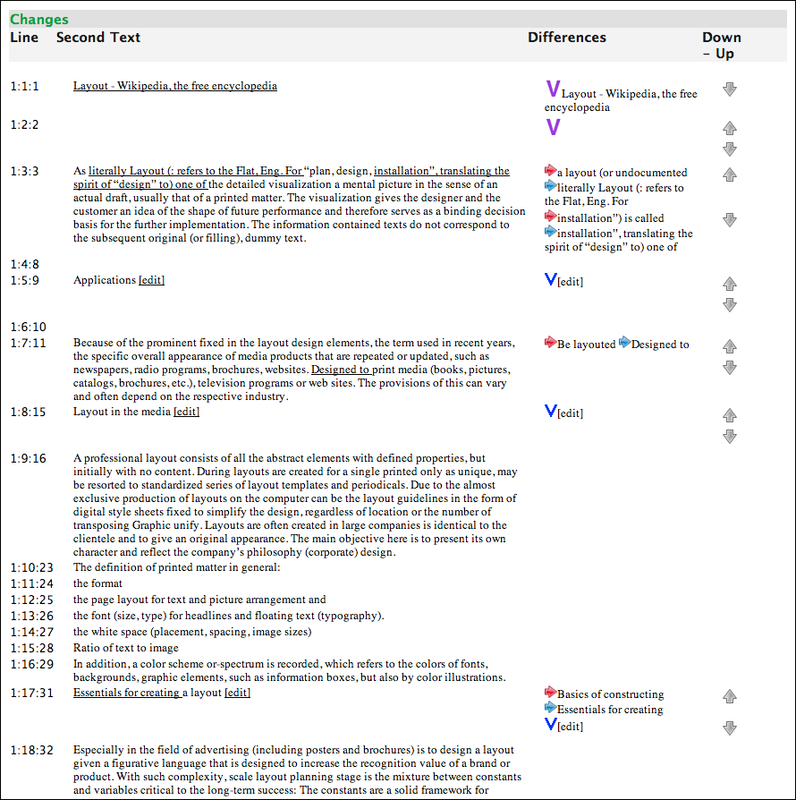 … displays only those paragraphs where changes have been made: unchanged text is hidden. 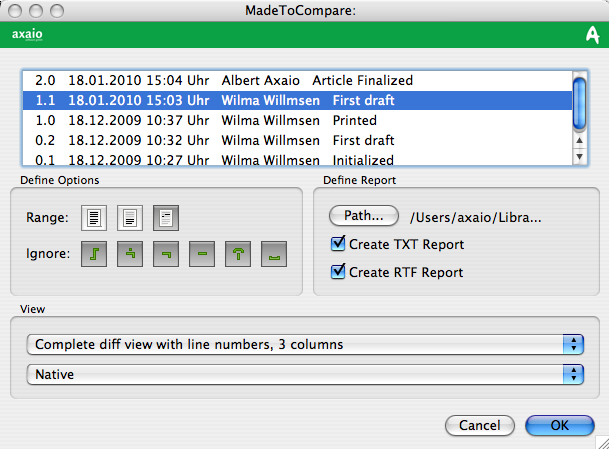 Similarly, MadeToCompare hides the ‘old’ text column in order to create a version for printing on letter paper. This version is particularly suitable if you need a compressed printout of the comparison. Complete overview with three columns and line numbers. Condensed view: The column with the ‘First Text’ has been hidden. 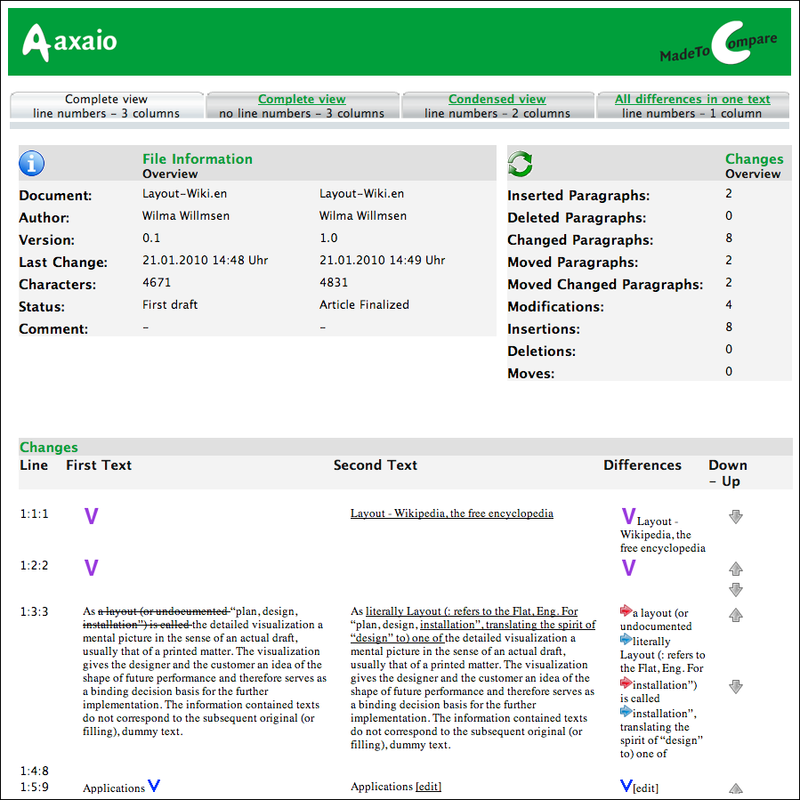 Only paragraphs containing revisions are displayed. After this there are arrows which take you from one change to the next and back again to the last revision. You know you have reached the last revision in the text when there is just one arrow left pointing back to the last alteration. 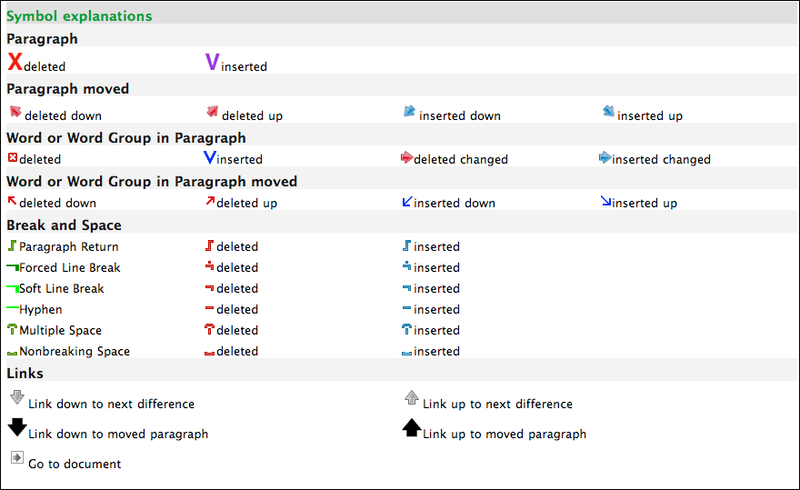 When jumping through the document being compared, MadeToCompare will automatically skip paragraphs in the text that are identical. If you opt for the optimized setting, MadeToCompare will not display the identical paragraphs at all. If a paragraph is moved (in the example above a paragraph has been found higher up in the text), a blue arrow labeled “Paragraph moved” marks the new position of the paragraph. In the left hand text column a blue arrow marks the position of the moved text in the ‘first text’. This blue arrow also serves as a jump label in the “first text“. 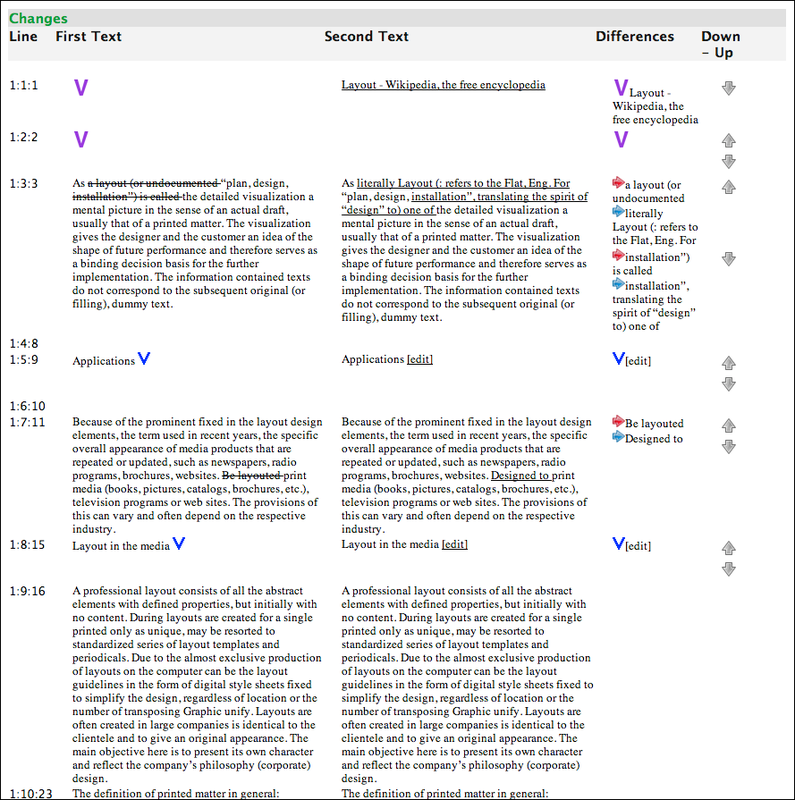 The column showing the second text displays the changes that have been made to this paragraph. The third column also has a blue arrow which serves as a jump command, indicating the position of the paragraph in the ‘first’ text. Display of a moved paragraph in an old version of a text. In the first text the display system for the moved paragraph is reversed. This time the first text is displayed with its revisions whereas the second text column displays an arrow which takes you to the position of paragraph in the second text. An arrow also appears. If a paragraph is moved (in the example above a paragraph has been found higher up in the text), a blue arrow labeled “Paragraph moved” marks the new position of the paragraph. In the left hand text column a blue arrow marks the position of the moved text in the ‘first text’. This blue arrow also serves as a jump label in the ‘first text’. Find the complete explanations of all symbols in the overview at the bottom of each page.